I don’t want to come out and say that I’m an indifferent parent; I’m just one of those parents who has priorities in addition to her children. And while my kids have always been and will continue to be my first and biggest priority, they get to own my heart – not every second of my day. Call me selfish or lazy if you must, but there are things I just don’t do for my kids because I’m a grownup and I don’t have to. I’ve earned the right to decide the things that benefit my children most. I’ve also earned the right to ignore the lies that mom guilt would have me believe. I’m a good – scratch that – great mom in spite of all that I don’t do, simply because the things I choose to do are done deliberately and with my whole heart. If you’re a mother who does it all and then some, you might not want to stick around for this post. Might I suggest a jaunt over to Pinterest to create something amazing out of used toilet paper rolls and homegrown kale to celebrate fall’s impending arrival? Just a suggestion. For the rest of you, let’s play a game! Surely you’re familiar with the adolescent game, “Never have I ever,” where you take turns revealing things you’ve never done. I think there’s usually drinking involved, so if you want to grab a tumbler of naughty juice before we get started, that’s cool. OK, I’ll go first. 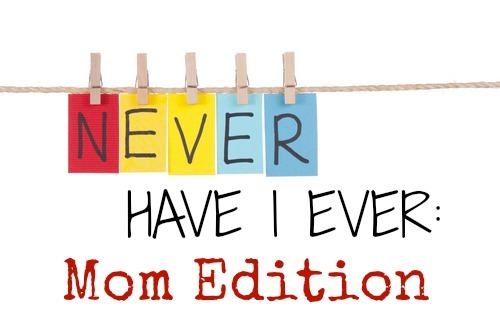 Check out my confessional “Never have I ever: Mom edition”! Amazing, I will definitely be responding to this one in my blog post tomorrow. Great idea! If I wasn’t at the office, I would have had to drink a few times, because I am guilty of a few of yours.